The Soave; Italian for "smooth" is a classic from Folonari and was recently rewarded a "Best Buy" from Wine and Spirits Magazine and called "a great party wine" and "easy to pair with all kinds of foods" by the Wall Street Journal. A blend of the indigenous Garganega and Trebbiano, this stainless steel aged white is light, fresh and clean on the palate, showing delicate, dry flavors and a crisp finish. Folonari Soave is straw yellow in color with a bouquet that is fruity and crisp. Delicate, dry flavor with a crisp finish. 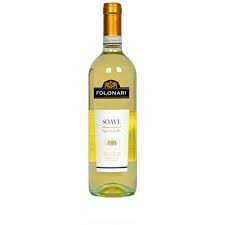 Folonari Soave wine is ideal with shellfish, seafood, chicken, salads and antipasto. The Soave; Italian for "smooth" is a classic from Folonari and was recently rewarded a "Best Buy" from Wine and Spirits Magazine and called "a great party wine" and "easy to pair with all kinds of foods" by the Wall Street Journal. A blend of the indigenous Garganega and Trebbiano, this stainless steel aged white is light, fresh and clean on the palate, showing delicate, dry flavors and a crisp finish.